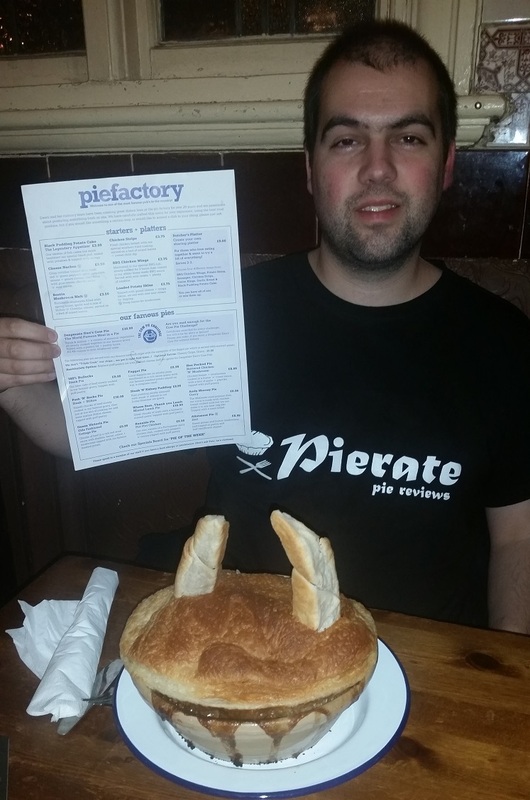 Day Three of British Pie Week saw Pierateers RAS, SJL and TJP complete one of their #PiePledge commitments by taking the day off work to go to the British Pie Awards, followed by a trip to Mad O'Rourkes Pie Factory pub in Tipton, Birmingham - something they've planned to do for years! Pierateer RAS and the Cow Pie! After spending day one away in Cardiff, picking up some Clark's Pies direct from their shop in South Cardiff as part of his #TriPie pie pledge, day three of British Pie Week saw the English leg of the pledge. In two parts, it consisted of judging for the first time at the British Pie Awards, followed by taking on the Desperate Dan Cow Pie Challenge at Tipton's very own Mad O'Rourkes Pie Factory pub. Hosted once again in St Mary's Church in the centre of Melton Mowbray, the British Pie Awards saw over 100 judges rate just under 800 pies this year. Pierateers Rob and Tim were both on the "Speciality Meats" category and we'll be writing up a review of the day soon, once results are out on Friday! In the meantime, you can catch up on our live blogging of the British Pie Awards, which includes a number of videos taken by Pierateer Sam. In the evening we made our way over to Tipton, just north of Birmingham, for a long awaited visit to Mad O'Rourkes Pie Factory. While Sam and Tim went for other pies, Rob took on the 4lb Desperate Dan Cow Pie Challenge, which you can read more about in our review tomorrow! On Day Three of British Pie Week Pierateer Sam continued his unique ways to eat pie series by doing a pie review in the middle of the British Pie Awards! With the awards only being held once a year, this immediately reduces the chances of being able to complete this particular way of eating a pie! This follows on from yesterday's Pie Kebab and Sam drinking a pie in Monday's pie-nt challenge, which you can watch the video of here.